The burglary happpened in the early hours of Friday morning (October 26) at a service station on the Larne Road, Ballynure. Detective Sergeant Crothers said: “It was reported that entry was gained to the shop between 2:00am and 2:15am and attempts were made to access a cigarette cabinet. “This was unsuccessful and, although nothing was stolen during the incident, significant damage was caused. 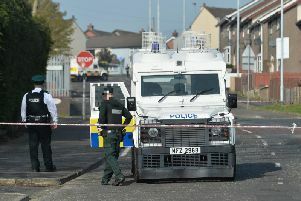 “Three male suspects, wearing light coloured clothing, made off on foot in the direction of Ballynure village.